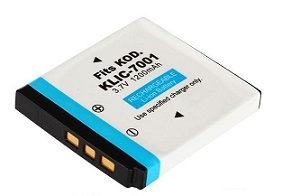 KLIC-7001: 3.7 volt 1200mAh rechargeable Li-ION battery for digital cameras. Fits Fuji FinePix F50fd, F60fd, F100fd, Pentax Optio A40, Optio S10, Kodak EasyShare V1233, V1253, M320, M340, M1073 IS, M753, M763, M853, M863, M893, M893IS, V Series V550, V570, V610, V705, Polaroid T1031, etc. Compatible With Battery model #s Fuji NP50, Kodak KLIC-7004, KLIC-7001,Pentax DLI68.